Backyard Cinema is a pop-up and theatrical cinema with a true independent feel that delivers a variety of cinematic experiences in unusual locations & venues around London. At Lost world you can experience cinema like you have never seen it before. Backyard Cinema is now a roaming, theatrical, cinema that shows a wide selection of films in a variety of iconic, unusual and immersive locations both in and outdoors around London. For fear of losing bound with the origins of outdoor cinema, Dominic Davies and his team mates have created an infrastructure that’ll make Backyard Cinema more memorable than any of its competitors. Backyard cinema started in a garden watching ‘Jurassic Park’ projected on a bed sheet and it has hosted zombie apocalypses, ‘Romeo + Juliet’ with a choir and hosted a series of outdoor screenings at the famous Camden lock market. Now their Next pop-up is lost world, a season of action movies screened in a jungle. Discover Backyard Cinema’s Lost World movies which include ‘Jurassic Park’, ‘The Hunger Games’, ‘Predator’ and ‘The Lion King’. Watch your favorite action and adventurous films in the deep venture of lost jungle where you can find beanbags, cocktails and popcorn alongside tropical plants & trees with sound effects and special surprises with your mates which gives an exceptional experience of watching movie forever. Before each screening there will also be live DJs. All tickets need to be pre-purchased online at backyard Cinema website. All tickets must be exchanged at the box office on arrival. Standard ticket is simply access to the brilliant movie. Thirsty Ticket gives you a killer cocktail with your movie. The date night ticket gets you your seats, a bottle of fizz, popcorn, ice cream & blankets, so you’re all set for the perfect evening out. 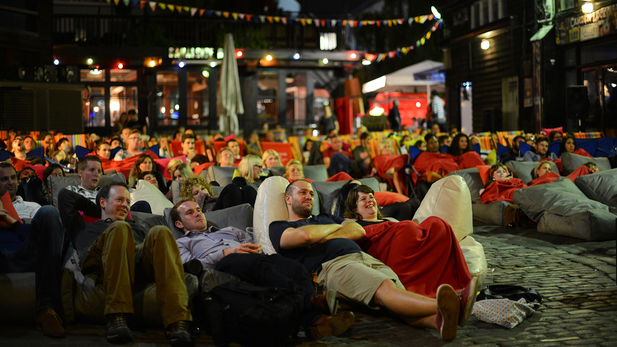 Backyard cinema is a best place to experience outdoor screening. It provides an easy access of transportation. Our London airport transfers provides executive car services to backyard cinema from all major airport terminals. We provide our services 24*7 at affordable prices. Pre-book our premium car services to ensure an enjoyable ride. It is nearest airport to Backyard cinema and is 10.7 miles away via A200 and it takes approx. 46 min. Approx. it takes 1h 18 min to reach Luton airport from backyard cinema as it is 35.1 miles away via M1. To reach southend airport from backyard cinema it takes approx. 1h 29min as it is 41.4 miles away via A13. It takes approx. 1hour 7min to reach from Stansted airport, the distance from backyard cinema to Stansted airport is 38.2 miles away from M11. To reach backyard cinema from Heathrow airport, it takes approx.1hour 3min as it is 21.5 miles away via M4.